MIAMI, FL--(Marketwired - July 12, 2016) - Marking a historic moment for Meliá Hotels International, one of the world's largest hotel and resort groups, its ME by Meliá brand officially opened its first-ever U.S. destination -- ME Miami -- today in Downtown Miami. The hotel bursts onto the scene with 129 luxury-appointed rooms and more than 1,000 square feet of prime meeting space. Guests will be able to enjoy brand signature suites, a 14th floor Sun Deck featuring open air Sunset and Sunrise pools and Bella's Bar, a poolside bar and lounge set to open later this Summer. The property will also introduce a fresh interpretation of The ONE Group's STK restaurant. The opening of ME Miami represents an exciting new chapter for the innovative lifestyle brand, which boasts destinations in London, Madrid, Milan, Ibiza, Mallorca, Cabo, and Cancún. CGI 1100 Biscayne Management, LLC, an affiliate of CGI Merchant Group, owns the hotel, which will be managed under the Meliá Hotels International brand ME by Meliá. CGI Merchant Group purchased the building in January 2013, and led the redevelopment of the original hotel from 56 to 129 guestrooms. The design-forward property underscores the ME brand's practice of opening destinations in capitals of culture and cool, a key characteristic that proved appealing to CGI. ME Miami is located in the heart of bustling downtown and within a stone's throw of major cultural institutions including the Pérez Art Museum Miami, Adrienne Arsht Center for the Performing Arts and the Patricia and Phillip Frost Museum of Science. The new hotel's enviable location is equidistant to Miami's flourishing communities located near downtown, including the popular and artsy Wynwood, booming Midtown, the Miami Design District, MiMo, Brickell, and the Arts + Entertainment District for guests to engage and discover. "The opening of ME Miami is not only historic because it is the brand's first-ever foray into the U.S. market, but also because it's an acknowledgement and celebration of Miami's thriving downtown community, which has undergone an extraordinary and exciting cultural renaissance," said André P. Gerondeau, Executive Vice President of Hotels, Meliá Hotels International. "As the brand does with all of its destinations, ME Miami really places the guest right in the middle of that urban vitality and momentum. We're excited about what we've achieved here, and know that our guests will find ME Miami a distinctive and compelling addition to an already robust portfolio of unique destinations." The ME by Meliá brand is known for creating experiences catered to each individual, while also encouraging social interaction. The ME guest is stylish, modern and smart, mixes business with pleasure travel and considers traveling an extension of the life experience. A mix of insightful design, inspiring art displays, global music, in-room amenities, signature food & beverage offerings and pet perks heighten the brand's appeal to guests' passions while exceeding expectations. 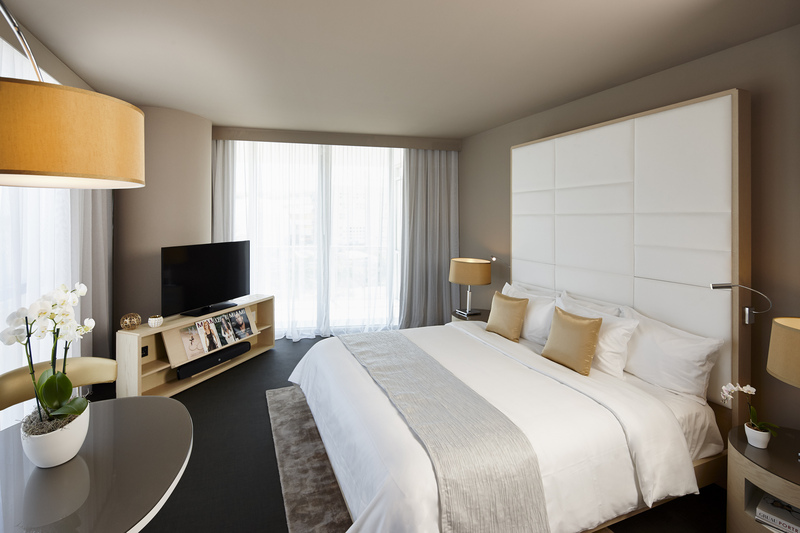 Well-appointed guest rooms feature custom furnishings, ultra-plush bedding, modern technology, in-room "Maxi" bars and spectacular views of the Bay and skyline. The soon-to-be-completed deluxe one-bedroom Personality Suite overlooks the city from the 14th floor, while the ultra-plush, two-bedroom Suite ME will provide an urban oasis on the 11th floor when it opens later this month. Suites come with ME+ Experience service, including customized check in and preferences for their stay. Premium Algotherm natural bath products that emphasize holistic wellbeing pamper guests in-room. In the Fall, the hotel will be introducing SKIN C featuring relaxing massages and services for guests. Pet-friendly welcome kits containing shampoo, a playball, mini towel and teeth cleanser are available by request, along with a plush pet bed, food & water bowls, and a slew of pet services including gourmet pet food specially-prepared by the chef for pets to enjoy during their stay. The hotel also has a partnership with renowned fashion photographer Alberto van Stokkum, which includes exciting installations on the 1st and 3rd floors, ME+ Suites and activations that will officially roll out later in the year. In the true ME by Meliá tradition of bringing the outside in, ME Miami has touches and influences reflective of its surrounding community. Floor-to-ceiling windows, vibrant art, lush greenery and multi-tiered public spaces provide an open flow and allow Miami's tropical vistas to provide the backdrop. Further, ME's Aura Experience Managers, a signature brand position empowered to curate the guest stay, set the mood throughout the hotel's public and personal spaces by controlling everything about the sensory experience -- from music, to lighting, to scent -- creating the perfect tone designed to inspire, invoke and ignite guests' passions. These individuals also serve as on-site experts allowing guests to make the most of their stay, from simple tips such as how to navigate the Wynwood art and bar scene to personalized suggestions on where to go and what to do, including an insider's guide to free, underground community events that only locals would be aware of. "CGI, and its entire development team, is excited to work with a brand of Meliá's caliber and is thrilled to see the fruits of more than two years' of work come together so beautifully. Investing in the coveted location of 1100 Biscayne and making it home to the first-ever ME by Meliá in the U.S. is a true milestone and responsibility for CGI," said Raoul Thomas, Chief Executive Officer CGI Merchant Group. "We look forward to introducing this exceptional space, culinary experience and creativity to the Miami community and beyond." ME by Meliá not only caters to its guests, but also the local Miami community through its unique pairing of signature entertainment and dining options. Resident DJ sets and special music-driven events that draw headliners from around the world for unforgettable parties are synonymous with the ME by Meliá brand, and ME Miami will be no exception. ME Miami will also be home to STK Miami, a fresh, new interpretation of the famed steakhouse concept by leading luxury hospitality brand The ONE Group. Situated on the hotel's ground level, overlooking iconic Biscayne Boulevard, guests can see and be seen amidst the bustling downtown area. Inspired by the emerging local scene, the restaurant will feature sleek, contemporary dining and lounge spaces by ICRAVE, as well as an in-house DJ. This will be the first newly-designed STK location to offer both daytime and evening dining, serving an array of reimagined classic American cuisine. Signature dishes include bite-sized Lil' BRGs made with Wagyu beef, Lobster Mac & Cheese, and of course, the highest quality cuts of steak. The ONE Group will also provide in-room dining, bites and cocktails Bella's Bar on the 14th floor pool deck, as well as breakfast service. The opening of ME Miami follows closely in the footsteps of ME Milan Il Duca, which opened May 2015; ME Mallorca and ME Ibiza in 2014; as well as the celebrated ME London opening in 2013. The brand will continue to expand with the exciting development of future properties in key markets, including ME Caracas in 2017 and late award-winning architect Zaha Hadid's ME Dubai, slated to open in 2018. Opening rates begin at $459 per night. For more information, please visit: www.ME-by-Melia.com. ME by Meliá is a contemporary interpretation of the Meliá experience. It is a brand which seeks to fuse innovative style with local flavors in order to captivate travelers of a common psychographic -- those with a decisive taste for cutting-edge art and design, international cuisine and world music -- rather than a common demographic. By capturing these elements in urban and resort destinations, this new philosophy ignites a passion in each guest while appealing to their senses and emotions. The experience is unforgettable. There are currently ME hotels in London, Madrid, Milan, Ibiza, Mallorca, Cancun and Cabo with openings slated for 2016 in Miami, 2017 in Caracas and 2018 in Dubai. For more information about ME by Meliá, visit us at www.me-by-melia.com, or visit follow us on Facebook, Twitter (@MEbyMelia) or Instagram (@me_by_melia). Founded in 1956 in Palma de Mallorca (Spain), Meliá Hotels International is one of the largest hotel companies worldwide and a leader in the Spanish market, with more than 350 hotels and 90,000 rooms in 40 countries and four continents under the brands: Gran Meliá Hotels & Resorts, Meliá Hotels & Resorts, ME by Meliá, Paradisus Resorts, Innside by Meliá, Sol Hotels and TRYP by Wyndham. Its product and service portfolio is complemented by Club Meliá, the only vacation club operated by a Spanish company. The strategic focus on international growth has allowed Meliá Hotels International to be the first Spanish hotel company with presence in key markets such as China, the Arabian Gulf and the US, while maintaining leadership in traditional markets such as Europe, Latin America and the Caribbean. Its high degree of globalization, a diversified business model, the consistent growth plan supported by strategic alliances with major investors and its commitment to responsible tourism are the major strengths of Meliá Hotels International. The company leads the Spanish market in number of hotels and resorts and greatest corporate reputation (Merco Ranking), remaining among the most attractive companies to work for worldwide. For more information about Meliá Hotels International, visit www.melia.com, or follow us on Facebook and Twitter (@MeliaHotelsInt). STK artfully blends the modern steakhouse and chic lounge into one, offering a dynamic, fine dining experience with the superior quality of a traditional steakhouse. STK distinguishes itself by focusing on the social experience with a sleek, contemporary design and an in-house DJ who creates an infectious, high-energy vibe. ME Miami will be home to a fresh, new interpretation of STK from leading luxury hospitality brand The ONE Group. Inspired by and uniquely designed for the emerging downtown Miami cityscape, the restaurant will feature both indoor and outdoor dining spaces with direct access to the iconic Biscayne Boulevard. This will also be the first of the newly designed STK restaurants that will be open for both daytime and evening dining. The menu features reimagined classic American cuisine with signature dishes like bite-sized Lil' BRGs made with Wagyu beef, Lobster Mac & Cheese, and, of course, the highest quality steak. STK Restaurants are currently located in New York City, Washington DC, Miami, Chicago, Atlanta, Los Angeles, Las Vegas, London, and Milan. Additional locations will be coming soon to cities such as Austin, Dallas, Edinburgh, Toronto, and San Diego. The newest STK will open in the ME by Meliá, at 1100 Biscayne Boulevard, Miami, FL 33132. For more information please visit stkhouse.com. The ONE Group (NASDAQ: STKS) is a global hospitality company that develops and operates upscale, high-energy restaurants and lounges and provides hospitality management services for hotels, casinos and other high-end venues both nationally and internationally. The ONE Group's primary restaurant brand is STK, a modern twist on the American steakhouse concept with locations in major metropolitan cities throughout the U.S. and Europe. ONE Hospitality, The ONE Group's food and beverage hospitality services business, provides the development, management and operations for premier restaurants and turn-key food and beverage services within high-end hotels and casinos. Additional information about The ONE Group can be found at www.togrp.com. CGI Merchant Group is a private-equity, alternative investment manager and developer ("investment managers") that invest in commercial real estate opportunities by using an entrepreneurial approach to building stakeholder value. Within the past six months, the Firm has deployed significant capital in multiple assets classes ranging from retail to office to leisure. The Firm has a wealth of knowledge of the capital markets, and when combined with ingenuity and experience we believe distinguishes us from other investment managers. We are contrarian, value-oriented investors that invest in commercial real estate and focuses on risk management. We operate our investment and development platform in an integrated manner, aligned with key capital and strategic operating relationships that has allowed us to scale our investments significantly. For more information about ownership of the hotel, please visit www.cgimg.com, or contact Kaitlin LaBruzzo at klabruzzo@pintausa.com.